A new publication aims to teach western Iowans and eastern Nebraskans a little more about the origins of their food. 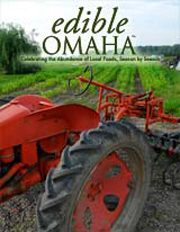 Despite the name, “edibleOmaha,” co-publisher Lucy Wilson says the quarterly magazine is designed for the entire region. Wilson plans to showcase farmers, chefs, vintners, brewmasters, retailers and farmers markets in both states. She says, “Our mission is to connect people to their local food sources by telling stories of our local farmers, chefs, entrepreneurs and even as common as our community gardens, our home chefs, home canners and to help us to connect to the most viable part of our lifestyle which is the food that we eat.” Wilson says it’s also important that city-dwellers know where their food originates. “The majority of our true local food source comes within a 100-to-200 mile radius into our city, so we want to be able to focus on the stories that talk about the ample amount of food that’s really available year-round,” she says. Many of Iowa’s popular festivals revolve around our ancestors — from Holland, Germany, Ireland, Norway and elsewhere. Wilson says stories in the magazine will strive to zero in on those cultural touchstones and traditions. “Be able to connect people to their roots,” she says, “why it’s important to maintain these traditions and the need to be able to pass along what I consider almost a life skill to our future generations of how to grow your food, preserve your food and celebrate your food.” Wilson says “edibleOMAHA” will be published quarterly so it’ll change from spring to summer and from fall to winter. She says, “It is seasonal so we will follow the seasonality of our food and our food systems as to what’s in season including recipes and featuring the cooks, the chefs or the events that are around the seasonal foods, introducing the farmers.” The first issue will be available at select locations tomorrow and will be distributed to more locations across the region soon.